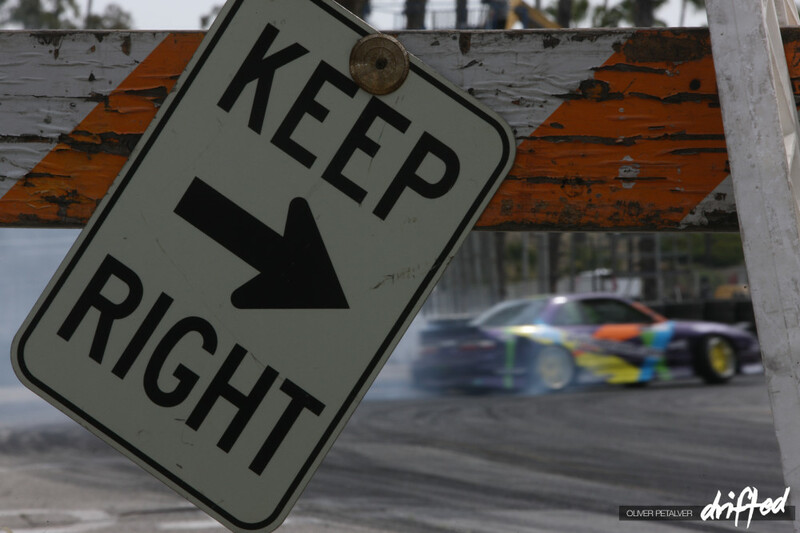 Formula DRIFT presented by GoPro entered its 11th season by opening the series on part of the Toyota Grand Prix Long Beach track. The same layout last year was utilized while approximately 20,000 fans came to experience the action. 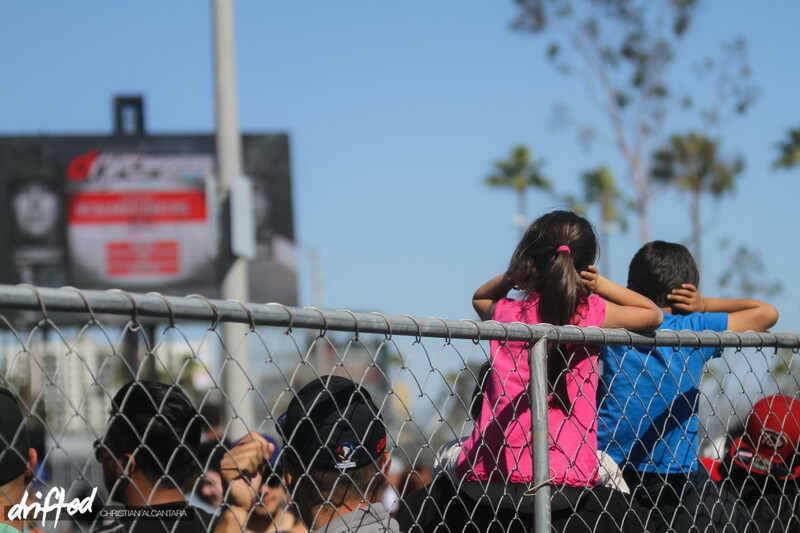 Additional stands were added but an overflow of fans was evident throughout the whole track. The event was once again sold-out and there were a staggering 1 million+ views via Livestream. 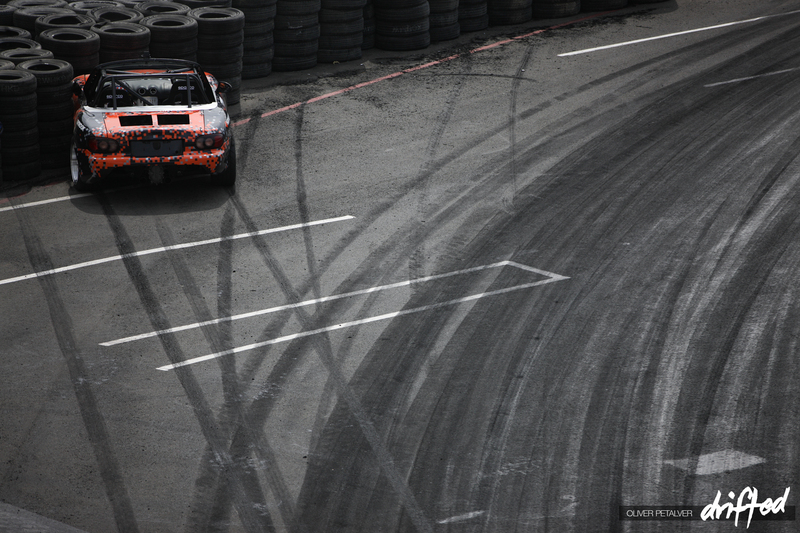 The popularity of drifting is rising exponentially and the live attendance for Formula DRIFT grows steadily each year. Maybe we’ll one day see a slightly different layout on a bigger track to accommodate the fans. 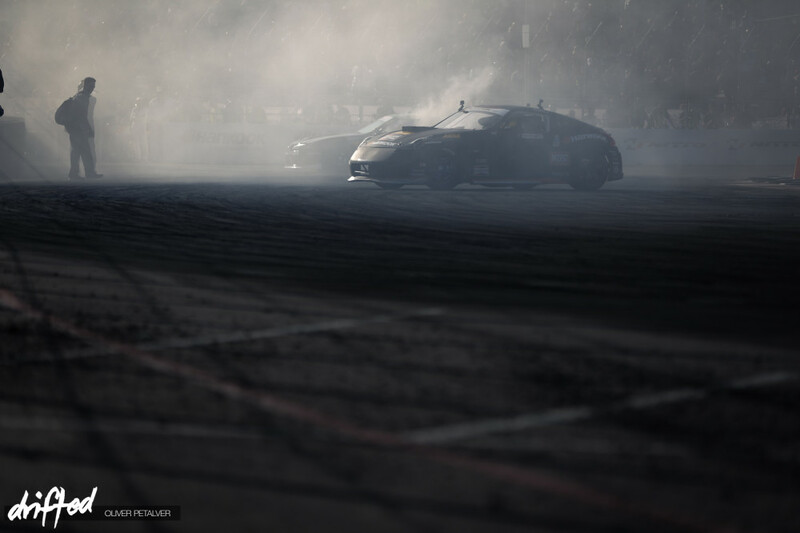 As many of you may already know, Chris Forsberg, in his 1000-hp Hankook Tire Nissan 370Z, took top honours in the event. Last year, Forsberg placed third in the same event. “We will try to keep the momentum with our new changes and take the championship home,” said Forsberg. Forsberg now has 8 wins notched under his belt. He is one away from tying Samuel Hubinette for lifetime wins. 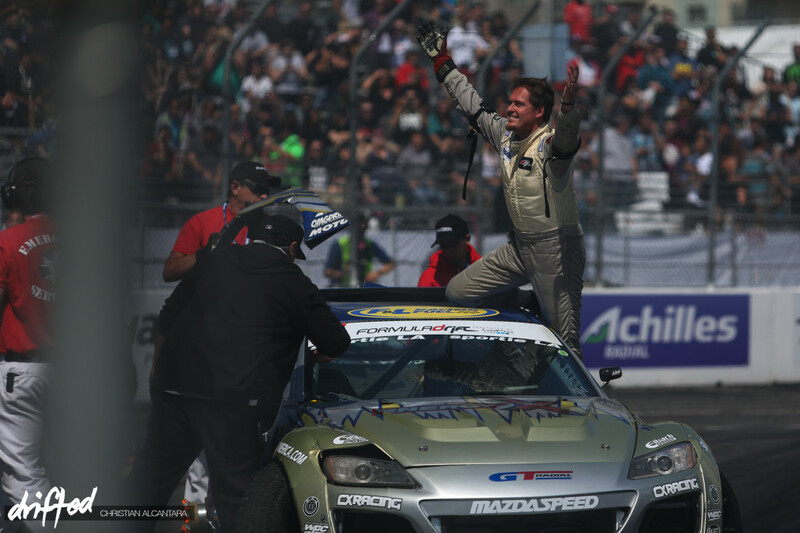 Forsberg is a ‘force’ to be reckoned with as he has an impressive resume, earning the title of 2009 Formula DRIFT and Triple Crown champion. It wasn’t an easy task for Forsberg to get to the Finals as he had to battle veterans in every round. 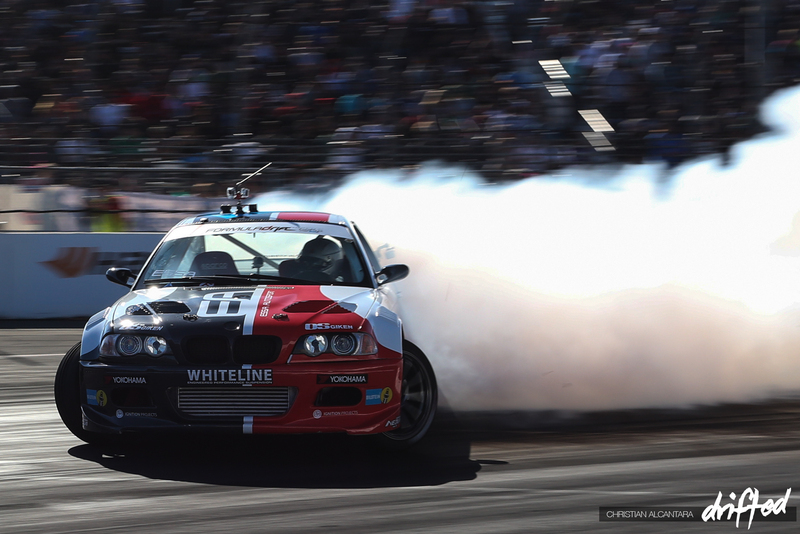 Forsberg started by going against Daijiro Yoshihara, Pat Goodin, Darren McNamara, and Justin Pawlak before finally meeting Kenneth Moen in the Finals. Defending 2013 Formula DRIFT champion Michael Essa slid his way past the competition into 3rd place in his Essa Autosport/Yokohoma Tire E46 M3. 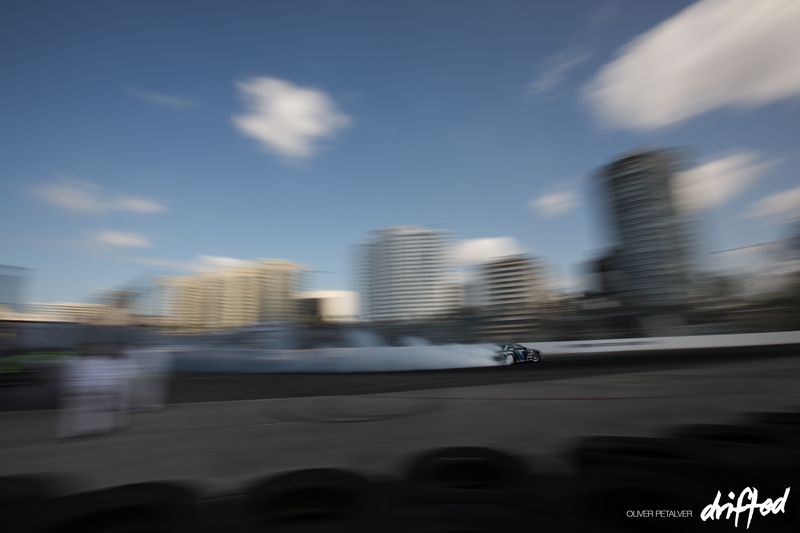 The other Bimmer, piloted by Chelsea DeNofa, scrapes its rear against the wall. DeNofa was defeated by Dennis Mertzanis in the Top 32. 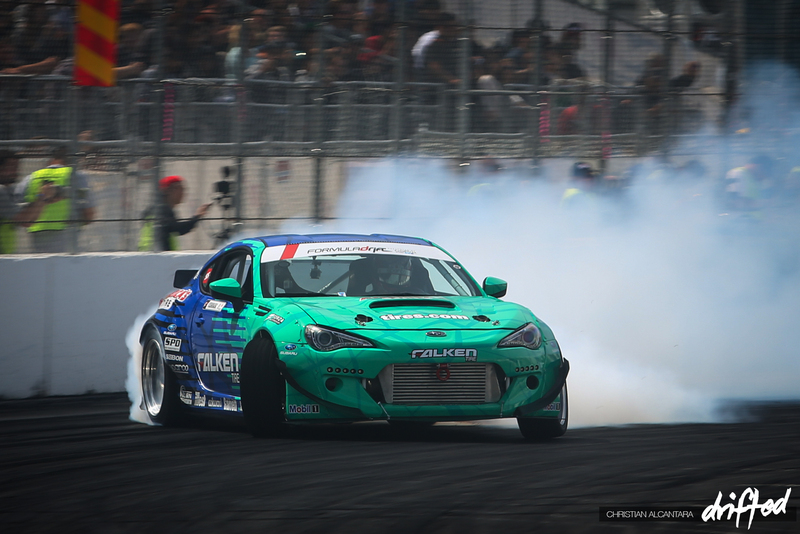 Last year’s Round 1 winner Daijiro Yoshihara debuted his new Falken Tire/America’s Tire Subaru BR-Z in place of his S13. Yoshihara was ousted in the Top 32 by Chris Forsberg. 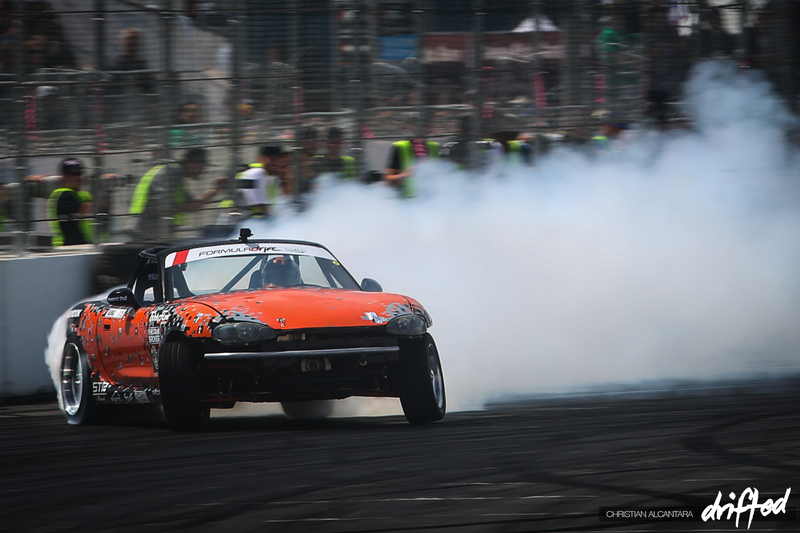 2012 Formula Drift season champion Daigo Saito didn’t make it past the Top 32 after being at fault for crashing against Patrick Goodin. Veteran Tyler McQuarrie, in the GoPro/Mobil 1/Hankook Tire Camaro, made it to the Top 16 but lost against fan-favorite Aurimas ‘Odi’ Bakchis (now sponsored by Nitto Tires). 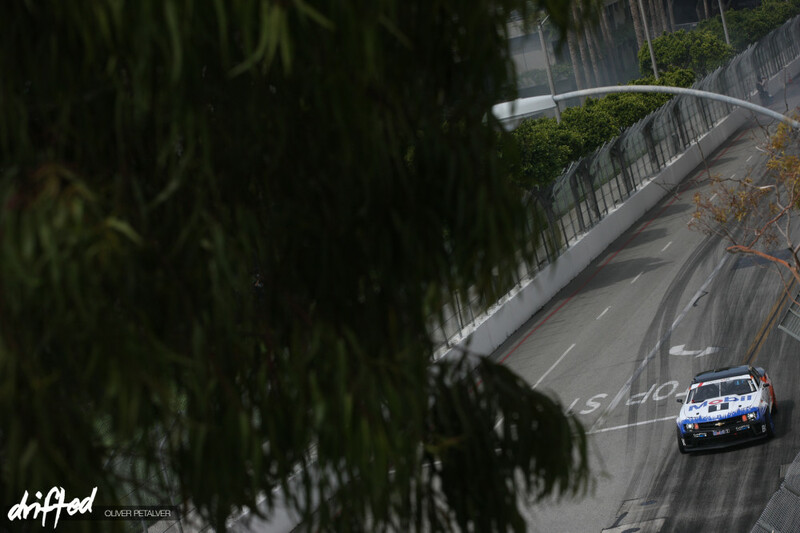 In addition to the debut of new cars and liveries, the two-day event was filled with a number of crashes. 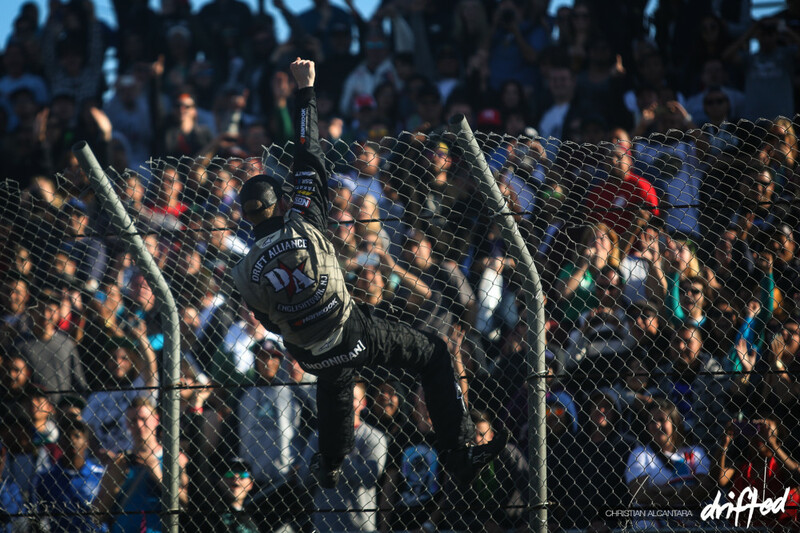 Long Beach local Kyle Mohan let his fans know that he’s ok after crashing into the tire barrier. Mohan’s team worked hard during the break to get the car up and running in time for the Top 16 against Kenneth Moen. Mohan is now sponsored by GT Radial since Nexen Tires pulled out of sponsorship this season. 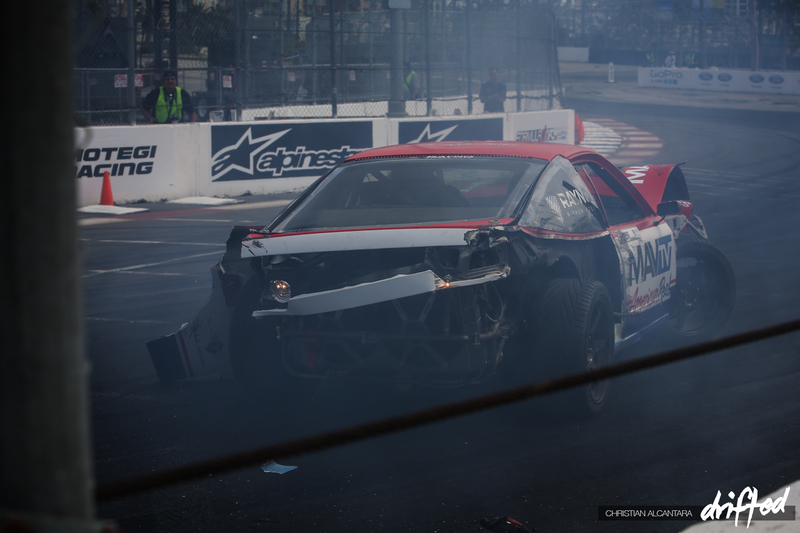 Unfortunately for Joon Maeng, he had one of the biggest crashes during the event in his Lucas Oil/Rayno Film S13. Another fan-favorite, Danny George, crashed his 1000-hp Team ‘Murica Miata into the tire barrier during the first turn of the course. Being a privateer significantly limits one’s ability to compete after a crash due to limited resources. Unfortunately, for Danny George, he was unable to proceed after this crash. 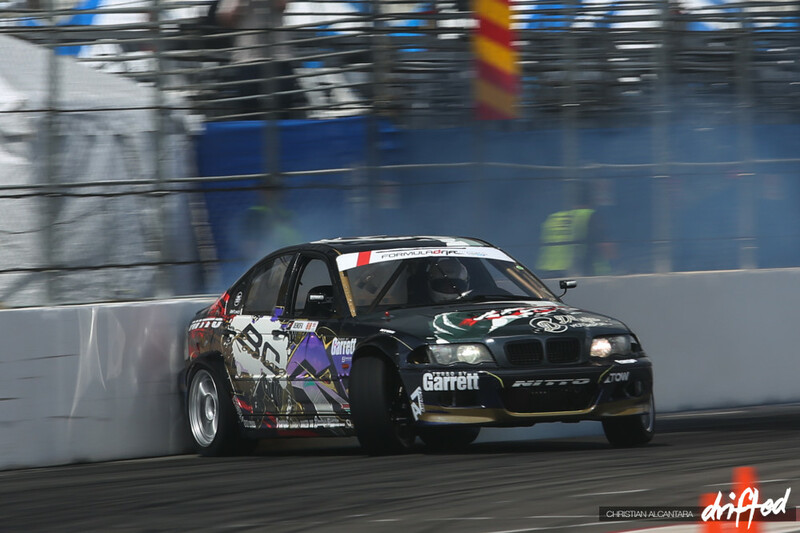 Fortunately for Canadian Dave Briggs, he didn’t crash his Achilles Radial / Turbo by Garrett S14. 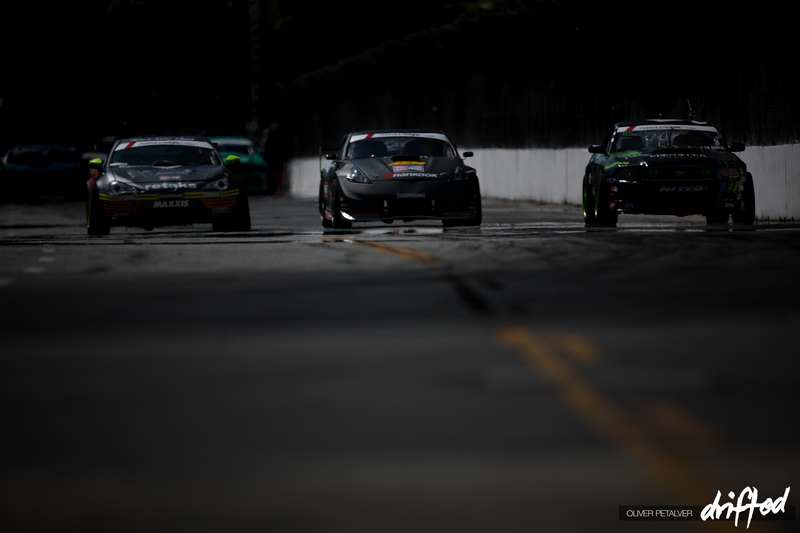 But he was knocked out early during the Top 32 by veteran Vaughn Gittin Jr. 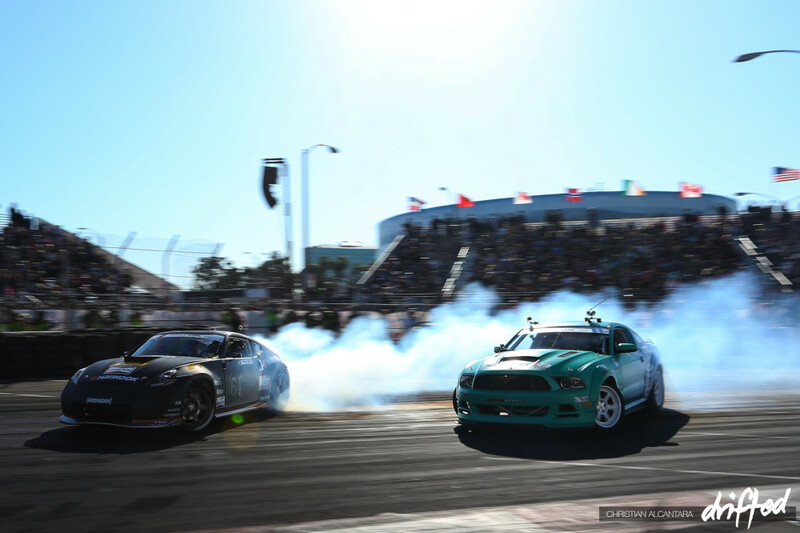 Unfortunately for Gittin Jr, he was defeated by former Falken teammate Darren McNamara in the next round. Ryan Tuerck‘s Retaks/Maxxis Tire FR-S sported sported new livery that’s more appealing with this gun-metal grey. 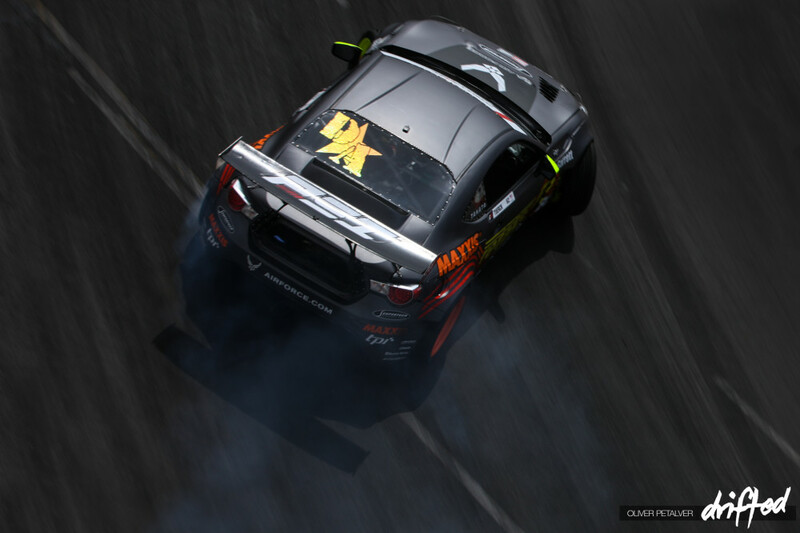 Tuerck managed to go into the Top 16 against JTP but didn’t advance any further.